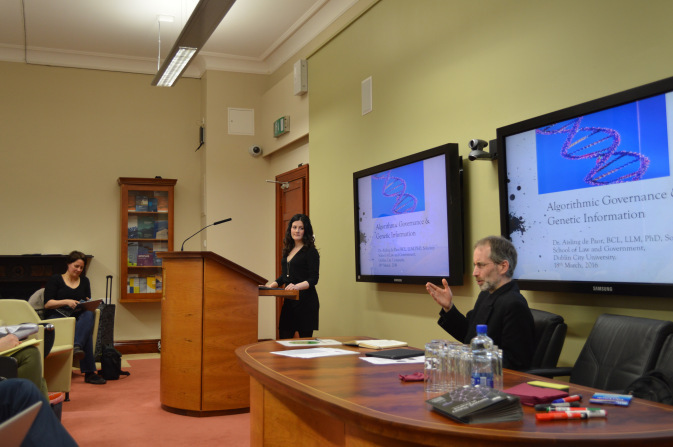 I had the privilege to participate in a workshop on algorithmic governance this past Friday at my alma mater, the National University of Ireland, Galway, under the supervision of Dr Rónán Kennedy and Dr John Danaher of the Law Faculty. and co-funded by the Colleges of Business and Public Policy. It’s part of a wider program of research grandly titled ‘Algocracy and the Transhumanist Project‘, which promises to tread some fascinating pathways. Comprehensive synopses of the event have already been published by Dr Danaher and one of the speakers Dr Muki Haklay, so I won’t re-do their work, but instead refer to one of the particularly interesting themes that emerged from the work. Based on the rich, deep and varied content across a dozen or so speakers, it’s clear that there is a significant amount of work to do in scoping, framing and perhaps even narrowing the domain. There was discussion on information policy and information ownership; on law; on military law. While that (military law, and specifically command responsibility) was primarily introduced as a potential model for accountability structures in the context of AI, it was clear that there are issues in the military domain itself that are of concern. While I am personally concerned with government in particular, as opposed to governance in general, it is the latter that occupied the thoughts of the workshop. There are also issues of identity (as Dr John Morison put it, there comes a danger that ‘we are no longer natural persons but rather temporal aggregates of data’) and of justice (are computer-derived or algorithmic findings admissible as evidence?). In a comprehensive and packed agenda, politics barely got a mention – but that too needs considerable discussion. John Danaher has done some initial work to address this challenge. He combines List’s ‘logical space of democracy‘ as a politics within which ‘collective decision procedures’ are agreed, with a four-component model of algorithmic decision-making, being ‘sensing-processing-execution-learning’. Adopting a basic premise that each component can be automated or human, the logic extends to a matrix of options within which a collective decision procedure can be agreed. It is a very useful abstract framework, though I would add a number of additional points. The political issues of legitimacy, sovereignty and accountability are not addressed (accountability in particular was a recurring theme at the workshop). Perhaps this is not a concern; it is perfectly valid to frame the discussion in the abstract, and it is indeed necessary to so do in anticipation of some practical application. Still further, it is possible to extend the abstraction and suggest that the subject (the human, the citizenry) be removed in favour of a theoretical programmatic, benign objective set (such as world peace, general contentment, and plenty). In such circumstances, the learning element of the four-component model not only serves to continually improve the model, but also decides upon the collective decision problems as well (the guiding input, as opposed to the sensed input). I sketched this model, or a variation of it, in a recent presentation (slide 17). Formulating the ‘world peace’ objective in code is of course no small objective, but the concept serves a theoretical function. Reversing that, however, and insisting that the human context within which the algocratic system functions should remain, then it should further remain on the other end, in the objective set. In the first instance, that requires a declaration that this is a consideration of algorithmic government, or algorithmic state administration, rather than merely an abstract decision environment. This is in part to add colour to what could otherwise be a mere systems analysis discussion (and Dr Willie Golden did a great job at the workshop sketching a brief history of information systems, making the point that this is not new! ), but also serves to surface the immediate issues of law, politics and policy that must be addressed as we advance into this new age. But of course, such a discussion may belong in an alternative domain, I don’t yet know enough about the scope of the research, and my much more eminent colleagues are far more immersed in this than I! Perhaps therefore the four-component model in a collective decision structure should be a first order framework, a governing structure, that guides an expanded model to incorporate constitutional law and public policy. Further research is needed in data protection, and human rights – there are a number of initiatives in that domain already. My own research is in law enforcement; William Gibson once said that the future is already here, it’s just not evenly distributed – and so it is that while we can envisage a future full of robot administrators, there is already a robot handing out fines and penalty points, so I am studying that. Anyway, a great workshop, kudos to John and Rónán, and I look forward to further opportunities to collaborate on these themes in the future!